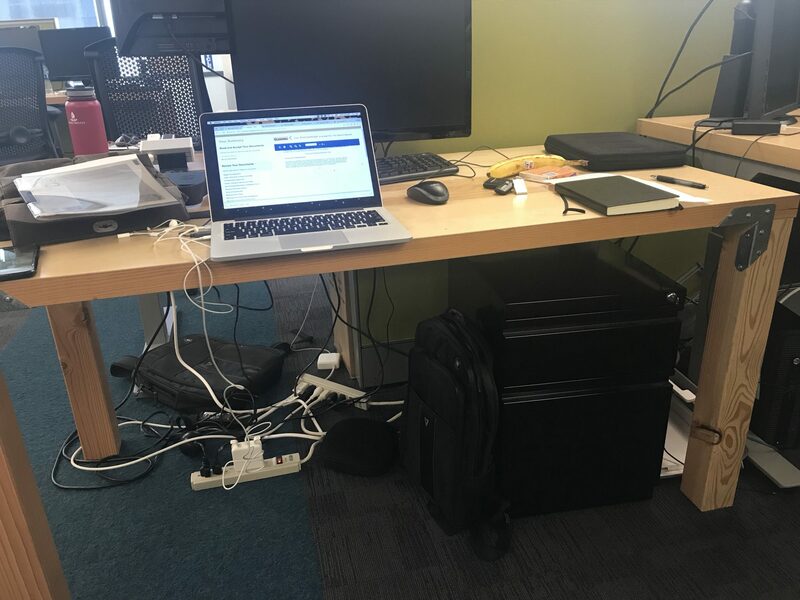 When Amazon first started, there was a lack of desk furniture. Amazon has a company culture of getting to solutions quickly and doing so in a straight-forward manner. In 1995 in what is now a archetypal symbol of the fast, practical solution, Jeff Bezos assembled a desk made out of a door. Above is the desk I got my first week at Amazon. Preference now is certainly adjustable desks so that I can adjust the heightthroughout the day to standing–but this one certainly is reminiscent of early Amazon. Ironically enough, when I was in college, I had a door desk and used it to great effect by commanding multiple computers and monitors. The setup J has in college boasted a Linux dual-screen workhorse, Windows machine, a Mac mini, and a dock and monitor for a laptop. The whole system had a vast array of monitors and used a single mouse and keyboard connecting the different systems with synergy. The entirety was a sight to behold and was certainly generous dispensing splinters until broken in.